Highway agencies will use more than $9.5 million in Highways for LIFE incentives to try innovations on 15 construction projects to improve safety, quality and user satisfaction while minimizing construction congestion. The projects include one each in Indiana, Iowa, Louisiana, Minnesota, New York, Ohio, Oregon, Pennsylvania, Puerto Rico, Rhode Island, Texas, Utah and Washington and two in Massachusetts. The Federal Highway Administration grants will fund the use of innovations such as precast concrete pavement slabs, prefabricated bridge elements, warm-mix asphalt, road safety audits and the Safety EdgeSM paving technique. The latest awards bring the total of Highways for LIFE demonstration projects to 43 in 29 states, the District of Columbia and Puerto Rico. The grants provide highway agencies with financial incentives to try proven but rarely used innovations. The Iowa Department of Transportation will use its award to replace a bridge on U.S. 6 over Keg Creek in Pottawattamie County with a prefabricated bridge system. It will be the nation's first project to use ultra-high-performance concrete for transverse joints at the piers that resist bending, increasing durability and reducing maintenance needs. Self-consolidating concrete will speed construction of the abutment piles. Using accelerated construction techniques will limit the project's impact on travelers to 14 days versus six months using conventional methods. In a project dubbed “Fast Fourteen,” Massachusetts DOT will replace 14 superstructures on seven bridges on I-93 in Medford in one construction season. Using prefabricated modular steel bridge elements will enable the contractor to complete much of the work away from the project location, enhancing safety. 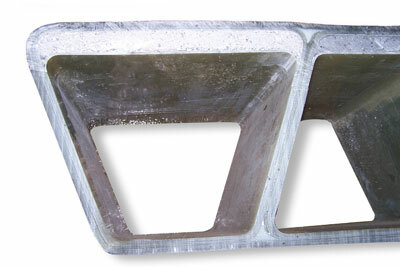 To minimize construction time, high early-strength concrete will be used for longitudinal closure pours. Construction of the bridges using traditional methods would take about three years. Massachusetts DOT will use another grant to replace Fleury Bridge on Mountain Road in Charlemont using three prestressed precast concrete double-tee beams known as NEXT Beams. The shape of the beams allows them to function as the superstructure and a stay-in-place form for the cast-in-place concrete deck. Using accelerated bridge construction methods to erect the beams and precast pile caps will cut construction time by two-thirds to about six months. Ohio DOT will use performance contracting and a two-step best-value design-build procurement process when it reconstructs the I-71/I-670 interchange in Columbus. The process will allow alternate technical concepts, under which the design-build teams can submit alternatives that may be better than the proposed scope. This type of contracting is expected to cut construction time in half, greatly reducing motorist impact. The Louisiana Department of Transportation and Development will try a range of innovations when it adds a continuous turn lane on LA 511 in Shreveport. The project will include an open-graded friction course that can reduce crash rates by increasing pavement friction and wet weather visibility. Roller-compacted concrete pavement, an asphalt-treated base course, precast gravity retaining walls, and polyvinyl chloride catch basins and manholes will be used to enhance construction speed by 34 percent compared to conventional approaches. Forty-three highway projects in 29 states demonstrate how innovations can enhance safety, quality and user satisfaction while minimizing construction congestion. Oregon DOT will use accelerated construction methods when it replaces the Burnt River Bridge on U.S. 30 in Baker County. One innovation will be precast high-performance concrete deck panels designed to minimize rutting from studded tires. Another is ultra-high-performance concrete for deck closure joints, making the deck more resistant to abrasion and nearly impermeable to chloride intrusion. The bridge is designed to last more than 75 years. Multiple innovations will help Pennsylvania DOT meet Highways for LIFE performance goals when it rehabilitates a section of State Route 3011 in Lackawanna County. They include the Safety Edge, a paving technique to reduce pavement edge drop-off crashes, and the road safety audit, a tool to improve roadway design and operations. The intelligent compaction method will be used to achieve consistent compaction during paving operations, and warm-mix asphalt will improve durability and minimize environmental impacts. The agency will add incentive and disincentive clauses to the construction contract to achieve a more durable pavement section. Rhode Island DOT will replace the structure for Bridge No. 435 in East Greenwich with all-precast concrete elements to speed construction, enhance quality and reduce the need for future maintenance. The elements include footings, three-sided bridge segments and wall stems for the wing walls. Using precast elements will keep construction time to about six months, two months less than using cast-in-place construction. Utah DOT will use hybrid composite beams when it replaces the Manderfield Bridges on I-15 in Beaver County. Because of their low weight, the beams can reduce construction time. The beams have a fiber-reinforced plastic shell that can provide a service life beyond 100 years. The bridges will require minimal maintenance because the beams will not rust or crack or need painting. When Washington State DOT replaces the McDonald Creek Bridges in Olympia, it will use innovative sustainable bridge columns under seismic loads on one bridge and conventional reinforced concrete on the other as a benchmark. The agency plans to include either a column with shape memory alloy reinforcement and engineered cementitious composite (“bendable” concrete) or a column with embedded elastomeric pads. Both column details can reduce the potential for earthquake damage. The grant to Indiana DOT will help the agency improve a section of State Route 13 under the Interstate 69 overpass in Madison County that has been hit by trucks several times because of low clearance. Using precast prestressed concrete pavement instead of a jointed pavement design will make the pavement thinner and expedite construction, minimizing traffic disruption. A new technique of using slider beams to place the pavement slabs will speed up construction. Minnesota DOT to expedite the replacement of a bridge on U.S. 53 over Paleface River in St. Louis County. Using precast panels for the bridge deck will result in lower permeability and longer life and reduce the need for routine maintenance. Because falsework construction and curing time will be eliminated, the agency anticipates a three-week reduction in construction time to about two months. New York State DOT will reconstruct the I-590/Winston Road interchange in Monroe County using diverging diamond interchange design. The innovative design eliminates left turns, which reduces the crash rate by a third. The design requires less new construction than the traditional partial cloverleaf interchange design, which will limit motorist impact to three or four months rather than several years. The new design is also about 25 percent less expensive. The Puerto Rico Highways and Transportation Authority will replace Bridge No. 1828 on PR 140 using geosynthetic reinforced soil system technology at the abutments. This technology uses alternating layers of compacted granular fill material and fabric sheets of geotextile reinforcement to provide support for the bridge. The use of geosynthetic reinforced soil and a precast superstructure will minimize traffic disruption and cut construction time. This type of construction is also 20 to 30 percent less expensive than a typical pile cap abutment. Texas DOT will replace the southbound bridge deck of IH-35W over 36th Street in Fort Worth with full-depth, full-width prefabricated deck panels. The roadway will stay open to traffic during construction with intermittent nighttime or weekend closures. The innovative feature will reduce construction time by eliminating the need for field placement of temporary or stay-in-place forms, reinforcing steel, and concrete placement and deck curing of up to 10 days. The Federal Highway Administration—working with state and county transportation officials, equipment vendors and highway contractors—is making substantial progress in its effort to achieve maximum implementation of Safety EdgeSM technology. The Safety Edge, one of the Highways for LIFE Vanguard Technologies, is a paving detail that consolidates the pavement edge into a 30-degree angle to mitigate pavement edge drop-offs, which can develop as material next to the pavement settles or wears away. A pavement edge drop-off can create problems if drivers drift off the pavement and drop onto the shoulder because they can oversteer and lose control of their vehicles when they try to reenter the roadway. A new Guide Specification for Safety Edge is available (see http://safety.fhwa.dot.gov/roadway_dept/pavement/safedge/docs/gsse.pdf). The new specification—which draws on field experience from eight demonstration projects— replaces the previous sample specification. FHWA conducted a 2010 field evaluation of the Safety Edge in several states. Results showed that the Safety Edge can be constructed in such a way that does not negatively impact paving operations, according to FHWA's Andy Mergenmeier, senior pavement and materials engineer. The Federal Highway Administration is working with state and industry partners to make use of the Safety Edge paving technique standard practice. A Transportation Pooled Fund Program study of crash data, commissioned by FHWA, estimates that the Safety Edge will reduce total crashes by 5.7 percent. FHWA named the Safety Edge one of five Every Day Counts accelerated technology innovations. The Every Day Counts initiative deploys innovations aimed at shortening project delivery time, enhancing roadway safety and protecting the environment. FHWA promoted the Safety Edge to government and industry officials during its 2010 innovation summits. The new guide specification describes in detail what the edge of pavement should look like when the Safety Edge is implemented. 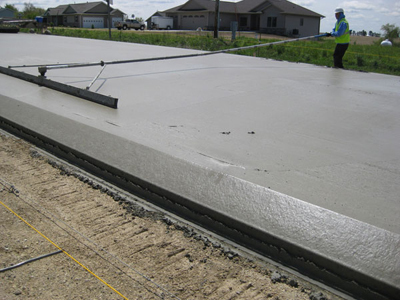 It covers concrete and asphalt pavements and overlays in both materials. In addition to building the Safety Edge in asphalt, the Iowa Department of Transportation constructed one concrete Safety Edge project in each of the new pavement and overlay types, with more planned for this year. The Safety Edge is designed to be built monolithically with the pavement, and the new specification says the slope should be about 1.5 to 1. Equipment and construction requirements are detailed in the specification, which was written to facilitate innovative methods to construct the Safety Edge that are not limited to existing equipment and processes. Several vendors, who provided input for the specification, offer a paver attachment that creates the Safety Edge. Vendors include TransTech Systems Inc., Advant-Edge Paving Equipment, LLC, and Carlson Paving Products. “The vendors have been very responsive and are improving their equipment,” Mergenmeier said. The eight-state study of crash data included three states—Georgia, Indiana and New York—that have used the Safety Edge treatment and participated in a multiyear evaluation of the technology. The study found that although the 5.7 percent estimated reduction in crashes is not statistically significant, the results obtained for total crashes were nearly always in a positive direction for the Safety Edge. The study also showed that the cost of adding the Safety Edge treatment to a resurfacing project is minimal. Overall project costs and the cost of asphalt resurfacing material did not increase for projects using the Safety Edge, compared to projects without it. For more information on the Safety Edge, visit /innovation/everydaycounts/edc-1/safetyedge.cfm. The Federal Highway Administration's newest Technology Partnership project will develop and demonstrate corrosion-resistant, lightweight bridge decking for rapid installation on movable bridges. BridgeComposites, LLC of Hornell, N.Y., will use a $460,305 grant to improve materials and manufacturing methods to reduce the cost of the composite bridge decking system and test it on a bridge project. The Technology Partnership program, part of the Highways for LIFE initiative, provides grants to private industry to help push promising late-stage prototypes that can reduce construction congestion and enhance highway quality and safety closer to commercialization. The composite bridge deck system is the eighth technology to receive a grant from the program. A Technology Partnership project is developing corrosion-resistant, lightweight bridge decking for quick installation on movable bridges. State highway agencies have expressed interest in composite bridge decking for use on movable bridges because lightweight decking can help save operating expenses and reduce life-cycle costs. The New York State Department of Transportation developed a bridge deck at the University at Buffalo made primarily of fiber-reinforced polymer composite materials. Lab tests showed that the deck can meet American Association of State Highway and Transportation Officials loading requirements, be installed quickly and easily, and endure the repeated loadings required for a long service life. Under the Technology Partnership project, alternative materials and production methods will be evaluated to develop a composite deck system that can be produced economically. Using specified deck performance criteria, preliminary dimensions will be determined and materials options explored through testing to determine the most promising combination of geometry, materials and fabrication method. Detailed manufacturing specifications and shop drawings will be produced to encourage broad acceptance in the engineering community. The deck system will be used on a bridge in Allegany County, N.Y., to demonstrate the practicality of the installation procedures and connection details. That deck replacement will be on a small fixed-span bridge to save costs, but future use is anticipated on movable-span bridges. Other partners on the project are Pennsylvania State University, LeTourneau University, Integrated Materials and Applied Computing Inc., and XC Associates. For more information on Technology Partnerships, go to www.fhwa.dot.gov/hfl/partnerships or contact Julie Zirlin at (202) 366-9105 or Julie.Zirlin@dot.gov. For details on composite bridge decking for movable bridges, contact Jerome O'Connor at (607) 725-0442 or jerome.oconnor@bridgecomposites.com. A Federal Highway Administration video on road safety audits, a Highways for LIFE Vanguard Technology, has won both International Safety Media and Telly Awards. The video, produced by FHWA's Office of Safety, explains the road safety audit process and the benefits of using an independent, multidisciplinary team to perform a safety examination of an existing or future highway. The video, which highlights how highway professionals across the country are using road safety audits, can be viewed at http://safety.fhwa.dot.gov/rsa/video2009. The International Safety Media Award came during the 10th World Congress on Injury Prevention and Safety Promotion in London. Earlier, the video won a bronze Telly Award in the safety category. Telly Awards honor the best local, regional and cable commercials and programs, video productions, and works created for the Web. The Vanguard Technology initiative is designed to accelerate the widespread adoption of high-payoff innovations such as road safety audits, which can improve the safety of roadway design, construction and operations and reduce the potential for highway deaths and injuries. 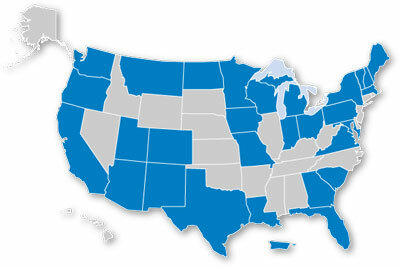 Every state in the nation has participated in road safety audit training, piloted or performed audits, or established an audit program. For more information on road safety audits, visit www.fhwa.dot.gov/publications/publicroads/10janfeb/01.cfm and http://safety.fhwa.dot.gov/rsa. Three-dimensional design modeling, common in the architectural world, is gaining popularity in civil design because it can produce better designs that need fewer down-the-road changes, according to speakers at a Federal Highway Administration Web conference. The conference, “3D Design: Better Quality, Better Product,” was part of the free “Innovations” series sponsored by Highways for LIFE and the National Highway Institute. The event, which can be viewed at www.fhwa.dot.gov/hfl/resources/#webinar, was developed in collaboration with the National Partnership for Highway Quality and moderated by NPHQ Executive Director Bob Templeton. Mark Taylor, FHWA safety and geometric design engineer, explained the difference between the traditional two-dimensional design process and 3D modeling. The 2D process uses 2D orthographic projection (plan, profile and cross-section views) to analyze and solve problems, while 3D modeling allows existing and proposed features of a design to be viewed geospatially from any perspective. The 2D process can be more prone to human error, and conflicts among design elements are not readily apparent, Taylor said. In contrast, 3D modeling gives the design and construction team a good tool to detect and solve conflicts, among other benefits. 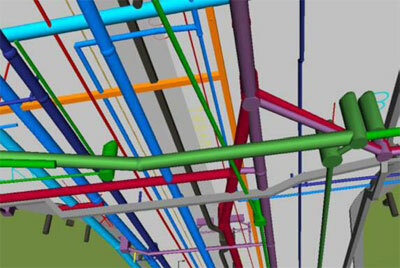 Three-dimensional modeling, such as this 3D view of underground facilities, enables highway designers to design and simulate projects in the virtual world. Three-dimensional modeling permits designers to design, build and simulate projects in the virtual world before executing them in reality, Taylor said. The 3D model becomes the central source of information, not 2D plans and cross-sections. With 3D modeling, the work flow is different, Taylor said. You build the project in the computer first, extract the traditional 2D contract plans and bid quantities from the 3D model, and export the 3D data files for automated machine controls to use in construction. “Using 3D simulation, we can virtually test-drive the road as a part of the design process methodology,” Taylor said. A 3D design approach can be used from project inception through the intermediate design stage—when stakeholder input can be considered—right through to final design and construction. Multiple disciplines and external partners can share the same model and add their input as the design moves along. Interoperability—meaning usefulness by various members of the building team—is the key to amortizing the costs for geospatial data acquisition and 3D modeling, Taylor said. It can be integrated with other 3D-based models, such as geographic information systems. It enables more effective use of topographic survey and mapping data. It expands the level of analysis and creativity through more effective use of the human brain's cognitive skills. Volumes and bid items are more accurate. Geometric errors and omissions are more recognizable. For design-build projects, 3D models facilitate better communication among the owner, designer and contractor. It supports automated machine guidance, by which the computer model essentially drives the cutting edges of earthmoving equipment. Jack Marshall of Kiewit Corp.'s design-build department outlined challenges of the 3D modeling process. He said design quality standards—including model content, level of detail and model accuracy—need to be defined by highway agencies and project owners, and designers must deliver 3D models that truly reflect the actual design. Dan Russell, director of construction technology for Sundt Construction Inc., pointed out benefits of the 3D modeling and coordination process: It shows the potential for prefabrication, which saves money over field fabrication, and it saves time on scheduling. And 3D modeling produces a better design with fewer changes in the field, Russell said. To register for “Innovations” Web conferences, designed to keep participants abreast of the latest innovations in highway design and construction, visit www.nhi.fhwa.dot.gov/about/innovationseries.aspx. Using alternate project delivery and accelerated bridge construction techniques, the Oregon Department of Transportation halved construction time while earning high marks from motorists on a Highways for LIFE project to replace five bridges. The project, which involved rapid removal and replacement of the bridges on an 11-mile (17.7 kilometer) stretch between the towns of Elkton and Drain, met the Highways for LIFE performance goals for safety, construction congestion, quality and user satisfaction, according to the Federal Highway Administration report Oregon Demonstration Project: Alternate Project Delivery and Accelerated Bridge Construction on Oregon 38. All five bridges on the mountainous two-lane road offered challenging site conditions, particularly two located at either end of the Elk Creek tunnel. For those two crossings, the Oregon DOT expedited construction and minimized traffic impact by building the new superstructures next to the existing bridges and easing them into place with a hydraulic sliding system during two weekend road closures. Implementation of a context-sensitive and sustainable solutions approach that minimized environmental impacts and streamlined the environmental permitting process. To meet the Highways for LIFE safety performance goal, the contractor used a variety of crash-prevention techniques, including calling in the Oregon State Police during major traffic changes and peak construction times. As a result, only three crashes occurred in the vicinity of the bridge sites, none attributed to construction activities. Everyone working on the project received site-specific safety training, and only a few minor worker injuries were reported. Using design-build project delivery, rapid bridge removal and replacement techniques and staged construction, the Oregon DOT finished the project in less than 18 months and met the Highways for LIFE goal of 50 percent reduction in the time motorists are impacted. Under conventional construction, travelers would have faced construction activity and lane closures for more than three years. Image One: An innovative hydraulic sliding system was used to move the bridge superstructures. 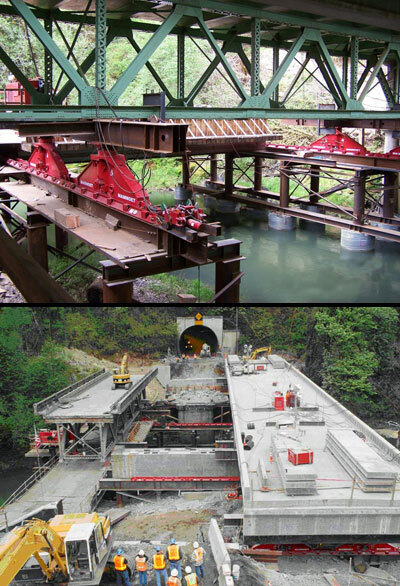 Image Two: At one end of the Elk Creek tunnel, removing the old bridge superstructure (left) and sliding the new one into place required just a weekend closure. A travel time study showed that drivers through the construction area experienced an average delay of five to nine minutes, below the goal of no more than 20 minutes beyond the normal travel time. The approach used was to maintain two lanes of uninterrupted traffic throughout the construction period, except for a six-week period on one bridge crossing that required use of a one-lane temporary bridge and two weekend closures to remove and replace structures on two other crossings. Although the quality of the replaced bridges was potentially improved because prefabricated bridge components were used, the replacement process had no impact on the noise and smoothness of the pavement surface. The Oregon DOT used a public involvement program that focused on schools, civic organizations and businesses to build support for the project. An after-the-fact survey found that 96 percent of respondents were somewhat to very satisfied with the project approach, while 95 percent were satisfied with the final product, well above the Highways for LIFE performance goal for user satisfaction. When the Oregon DOT compared the cost of using innovation on the project with similar projects built using a more traditional approach, it found it saved about $2.4 million, 5 percent of the total project cost. Those savings stemmed from shorter construction time, reduced impact on highway users and the use of innovative bridge removal and replacement techniques. To see the Oregon and other follow-up reports on Highways for LIFE demonstration projects, go to www.fhwa.dot.gov/hfl/projects.